I partnered with Audible to bring you this sponsored post. 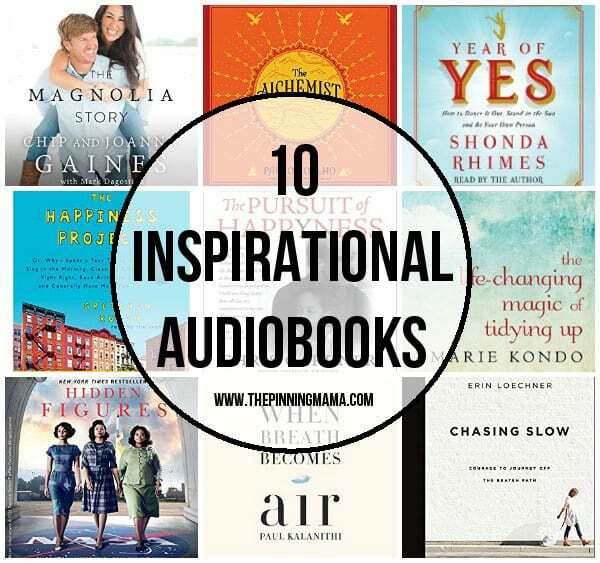 I love to read and have really enjoyed using Audible to listen books so that I fit them into this busy life! Me time. Sometimes I wonder what that is. Is it just the time that there are no toddlers hanging on me, or the time at night when the house is quiet? Or does it only qualify if I am doing something that really feeds my soul like spending time with close friends or curling up with a good book? It seems like I have come to the realization in these busy years of long days that you can’t have everything. You can have a little bit of a lot of things, or you can have more of a few things, but time is stingy and never relents to give more than 60 minutes in an hour and 24 hours in a day. The only way to seemingly get “more” is to work smarter not harder. Use those little minutes that get lost in the dishes and carpool lane. That is where audiobooks have become my best friend. It seems that at the end of the day, once everything is really done, it is so hard to hold my eyelids open to read a book. Even if I really want to and I really, really love the story. Besides just giving me a little more time for losing myself in a book, it also makes the parts of the day that are… well… not my favorite, whiz by while I am wrapped up in the words that play around me. Audible is great because they have almost every book I search for in their huge library and it syncs across all of my devices so if I am listening to it at home while I am cleaning the bathroom and then it is time to go pick up the kids, I can just pick up where I left off on my phone. Seriously, technology is great right?! If you haven’t tried it, you can even get a free 30 day trial here! While I love fiction, I have been really enamored lately with inspirational books. I don’t know if it is that there is so much going on that it feels good to hear words of wisdom to keep me going, or if I am now just *gasp* a little more mature, but the words of others have such a profound way of gently working your heart into the place you know you have been wanting it to be. The list of books below are a combination of my recent reads that I have loved and what is next on my listen list at Audible. They are books that inspire and move your heart. They are books that teach a lesson, or talk about life and what truly defines it. There are some with laughs, some with tears, and some that motivate you to do the things that have been sitting on your to do list for days, weeks, months, and I am so guilty of even years. Admittedly, some are going to make me think harder than I wanted to but at this stage of life, I need that push to learn, grow and be the person I want to be in this world. So take a look, read it over, and let me know what is the next book on your list! Also, if you have a must read for me, then please, please let me know in the comments! I love nothing more than a great book recommendation! Chasing Slow by Erin Lochner – This was my most recent book and I absolutely loved the premise! While everyone else is chasing more, Erin tells the story of how she and her family decided to chase less. I have often been wrapped up my own achievements. Can I do more, make more, have more fun with my family, more memories with my kids? These things don’t always come with more and I learned from Erin just how powerful less can be. I love that this read more like a story than a self help book and just draws you in to her life and the lessons she learned. The Life-Changing Magic of Tidying Up: The Japanese Art of Decluttering and Organizing by Marie Kondo – I can’t tell you how much I needed this book. The premise is to surround yourself by only the things that bring you joy, and in reality that is very little. I have felt drowned in stuff over the past year. I feel like I am cleaning up stuff and yelling at kids to clean up stuff more than I am spending time enjoying the STUFF. I heard a statistic that a woman’s stress level is directly correlated to the amount of stuff in her home. This little gem got me to listen to this book when I have been putting it off for ages (in reality terrified of having to get rid of my precious stuff.) Over the past few months I have gotten rid of stuff FINALLY. And it feels so good! If you feel like you are spending more time stressing and fighting over the stuff than you are enjoying it, then this one might be as good for you as it was for me! Essentialism: The Disciplined Pursuit of Less by Greg McKeown– This is the next book on my list. My friend Dawn said this book changed so much for her on the way she runs her life and business. As I am writing this I just realized that my first three recommendations are all about how to have less. I think it is such a relentless world in which we live. You are always told you need to buy or be something else and I think the less movement is so refreshing. It is the most amazing feeling to hear that what you have and who you are is enough! Year of Yes: How to Dance It Out, Stand In the Sun and Be Your Own Person by Shonda Rhimes – Just to balance out the less, I have heard that this book by Shonda Rhimes is all about how saying yes changed her for the better. It is about getting out of your comfort zone, and having experiences that make you a better mother, daughter, sister, and friend. I can’t wait to dive into this one! The Magnolia Story by Chip & Joanna Gaines – If you are as in love with Chip and Jo Jo as I am then put this on your list. I haven’t read it yet, but judging by my absolute love of everything they do I know it won’t disappoint. The thing I love most about them is how rooted they are in themselves, their family, and their faith. The combination of their talent and humility is inspiration at its best. Hidden Figures: The American Dream and the Untold Story of the Black Women Mathematicians Who Helped Win the Space Race by Margot Lee Shetterly – If the movie is good, the book is always better! This story is truly one that makes you laugh, cry, and yearn to be a better person. I don’t know one person that has heard the story that didn’t absolutely love it. It is also a great one to listen to with your kids, and especially daughters to show them that you CAN do anything. The Alchemist Paulo Coelho – This is another book on my list. It is the second best selling book in the world, and I am assuming there is a really good reason. It is a story of dreams and following them. When I am feeling in a rut, a story like this is just the thing to bring me right out of it. The Pursuit of Happyness by Chris Gardner – There are times I work hard, and there are times I am just lazy. When I hear a story like this one though of working hard and overcoming adversity there is nothing that puts life in perspective and gets me back to work on my passions quicker. This is a story of a father’s love and his absolute drive to make the life for him and his young son better. When I have a hard day with the kids, this story certainly puts our blessings in perspective! When Breath Becomes Air by Paul Kalanithi – This book is so highly rated and one I know will stretch both my mind and soul. It is the story of a top doctor that goes from saving lives to facing a life threatening illness of his own. He reflects on the fabric life and what really makes living. Although this book is in some ways heartbreaking, it is also one that stretches us to really make our lives ones that matter. An Uncomplicated Life: A Father’s Memoir of His Exceptional Daughter– One of my best friends has a child with down syndrome and the journey she has been on has opened my eyes to the absolute joy that their son has brought to their family. This story is a father’s letter to his daughter with down syndrome and the extraordinary lessons he learned though her journey though life. The Happiness Project by Gretchen Rubin – If there is any book to end on it is this one! Gretchen Rubin goes on a mission not to uproot her life and make huge changes to find happiness, but to make changes within the life she was already living through making goals and challenges based on the wisdom of ages. I love that this story is one of real life and completely relatable! These are all books that inspire, and they are all available not only in book form but also as audiobooks on Audible (go grab that free trial!) so that you can use those stolen moments while folding laundry or running errands to learn a lesson, find a way to do less… do more… or maybe just more of the things that really matter. Cheers to living life better and fuller! I’ve read a couple of those. I am excited to try the others! Love this! I LOVE reading! Adding these to my to-read list! !